We enjoyed wonderful weather had a great day this past Tuesday from 12-3 at the State Capitol lawn with our AWF partner affiliates. Ken/Terry and myself staffed the AAF Booth. Wild Game was served by both the Back Country Hunters and AWF Linda Dightmon. It ended up lightly attended due to packed House and Senate day calendars but those members who came out learned a lot about our states Critter/Conservation groups. This photo features House Member and Public Lands Holiday Bill sponsor and House Lands & Agriculture Chair Tim Dunn. The AWF plans to make this an annual event. The AWF sponsored AZ Public Lands Day Bill is HB-2271. It left the House Chamber with a resounding 60-0 approval a short time back. Public Lands day will be a focus for both celebrating our Az resource but also a "Projects Day" to encourage volunteer-ism on that day something we and all critter groups are quite familiar with. The Bill is up for scheduling in the Senate and hearings will be held in the next few weeks. I'll keep you updated on it's progress and will again be testifying in support of the Bill on behalf of the AAF. We hope to see more sportsmen show up next year! See a short video about the project. By Glen Dickens, VP/Grants/Projects Mgr. 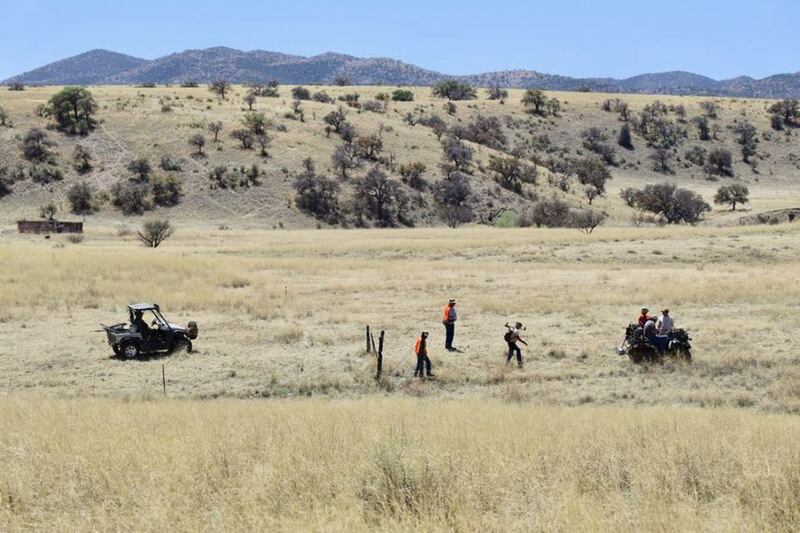 Another successful AAF fence modification/removal project was completed by 23 volunteers in Southeastern Arizona on September 28 and 29, 2018 in the northeast end of game management unit 32 near Bonita. We modified 3 miles of existing boundary fence north and south of the High Creek Road. We removed the bottom barbed wire strand and replaced with smooth, along with installing replacement stays along the fence line. Fridays work day was spent removing mesquite that had grown up along the fenceline. During the project weekend, multiple sightings of rutting pronghorn occurred by most everyone traveling to the camp site on USFS land at the western end of the High Creek Road. This effort is in direct proximity to ongoing mesquite removal for the Bonita Grasslands NRCS/G&F restoration project with a goal of improving an additional 10,000 acres in the next 4 years. Over the past 8 years, the areas adjacent to and within this project have been grubbed and new waters and boundary fence installed. These projects will help ensure that resident pronghorn and mule deer can safely utilize open grassland corridors without interference due to fence line obstructions. It assisted in accomplishing a key portion of the overall Bonita Plains pronghorn travel corridor improvement project. 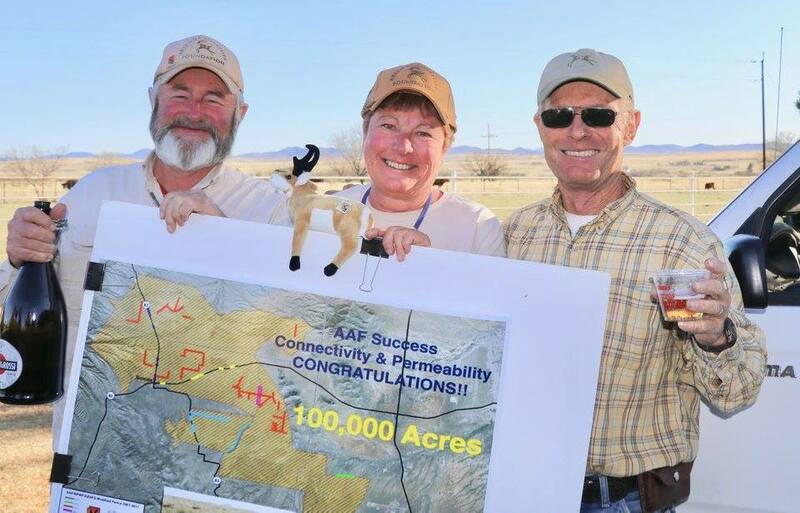 This project effort benefits the National Fish and Wildlife Foundation grant in that all labor hours, materials and mileage from this project were used to match the AAF’s $430K 8-year grant for our “Southeastern Arizona Grasslands Pronghorn Initiative”. The grant has a goal of improving up to 100,000 acres of “Pronghorn habitat connectivity”. This goal was met in April of 2018 at Elgin and we are continuing to add to that total through the end of the grant period in calendar 19. -Representing the AAF Board: Ken Meadors, Gary Boyer, Al Sue, Ken Meadors, Joe-bill Pickrell and yours truly. -Other AAF members and volunteers: Betty Dickens, John Millican, Mary and Bill Keebler, Dale Maas, Ron Day, Dave Cruce, Jason Angell, Cameron Becker, Jeff Gillon, Clyde Morris Joelle Buffa, Dave Laird, Darrel Wood, Rene Dube, Warren Adams, Bill McClendon, Jeff Hannum and Steve Tritz. Thanks, everyone for your efforts! Another successful AAF project was completed by 39 volunteers and Arizona Game and Fish Department (AZGFD) personnel in southeastern Arizona on April 13-15, 2018. On Friday we modified and repaired a quarter mile section of fence that is an entrance into a newly identified 320 acre “Fawning Pasture” as well as modified a 500-foot section of fence on the south end of the Upper Elgin Road allowing access to a 2,400-acre pasture. We removed the bottom strand of barbed wire, replacing it with a single strand of smooth wire at a height of 18 inches and replaced all fence stays and posts as needed. Within just 2 weeks of the fence modification 17 pronghorn were observed in the 2,400-acre pasture and in early June a fawn and mother were observed in this newly accessible pasture. Success! On Saturday we modified 2 fences both approximately .75 miles in length that bordered a horse pasture to the northeast of the 2,400-acre pasture. This permits pronghorn to pass through the horse pasture to the south as well as gives them access to a permanent water that they could not utilize previously. 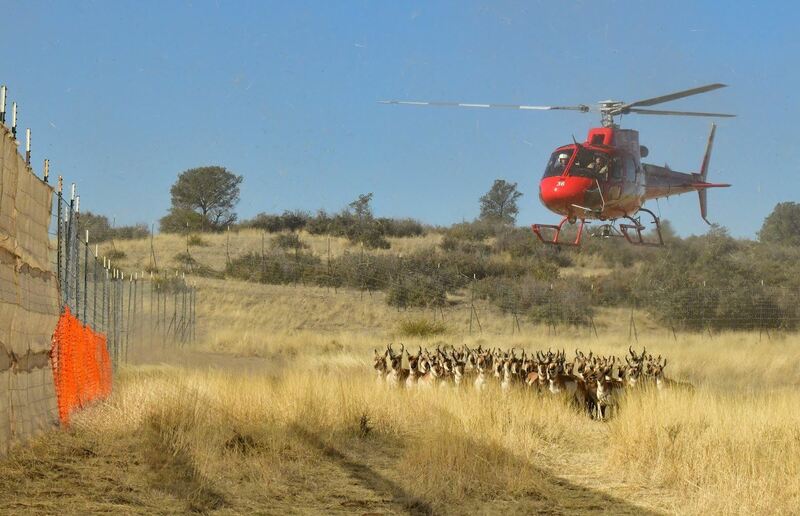 This modification improved pronghorn access to another 3,000 acres of habitat. Fence modifications were similar to those listed previously. The really good news! All 4 of these fence modifications have been caused by the increased herd in this area (now 120 animals minimum, up from 17 in 2012) utilizing and pioneering suitable habitat areas previously unoccupied by Pronghorn. This project is likely a final “Capstone” effort and will complete free pronghorn access in the southeastern portion of the Santa Cruz Plains pronghorn corridor improvement project. Everyone who worked on both days enjoyed multiple sightings of the resident pronghorn. All fence materials for this project were purchased with National Fish and Wildlife Grant funds and this effort benefits the National Fish and Wildlife Foundation grant in that all labor hours, materials and mileage from this project will be used to match the AAF’s $430K 7-year grant for our “Southeastern Arizona Grasslands Pronghorn Initiative”. 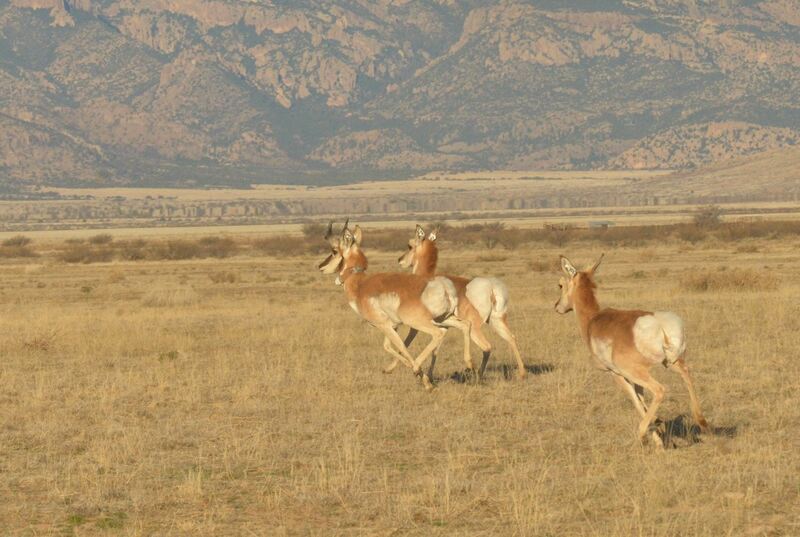 The grant has a goal of improving up to 100,000 acres of “Pronghorn habitat connectivity”. This project put us over that magic mark!! Camp was located at the Rose Tree Ranch Corrals. Thanks, as always goes to Bill Brake and Al Wilcox for again agreeing to host our camp site. Dinners were served on Friday and Saturday nights provided by Mary and Bill Keebler and they hosted Saturday and Sunday morning breakfasts as well, thanks Mary and Bill! -Representing the AAF Board: Al Sue, Ken Meadors, Kara Jensen, Terry Schupp Connie Taylor, Gary Boyer, and yours truly. -Other AAF members and volunteers: John Millican, Joe-Bill Pickrell, Dave Laird, Richard Roller, Colin Hurkett, William Gray, Tyler Mayberry, Dave Cruce, Bill/Mary Keebler, Betty Dickens, Warren Adams, Ray Blanchard, Jay/Connie Leadabrand, Rene Dube, Sherry Kapaldo, Ray Emmerich, AE Montiel, Bill McClendon, David Breeden, Johnny Johnson, Jason Angell, Darrel Wood, and Robert Velasco. SAY WHAT??? Arizona Antelope Foundation BUILDS A Fence??? Yes, it’s true. I’ve been on the AAF Board now for 8 years and this is our 1st recorded “Fence Building Project” during my ten- ure. The good news we had 35 volunteers that made the long drive to Ajo and another 9 miles northeast of there to the desig- nated desert camp-site. The project work date was another 1st being held in the middle of the winter on January 27, 2018. So why this location and why build a new one-acre live- stock/burro proof fence around a seasonally filled livestock tank? Presently when full it attracts feral cattle and horses from nearby reservation lands onto the eastern edge of the Son- oran Pronghorn habitat as well as resident burros. This fence construction project will permit access to the water by all wild- life but prevent access by trespass feral livestock and burros. This project was identified by the Bureau of Land Management as very high priority need and the BLM not only provided all the materials but set all five corner posts in concrete the week prior to our work date. Thanks Mike Daehler, District BLM Wildlife Biologist! -needed livestock fence in this zone as to make it more attractive to Son- oran Pronghorn. This was the first of at least two projects and likely more we will be doing in this zone. Next January 2019 we will begin removing fence but more centrally south of Stanfield and Interstate 8 east of Gila Bend. removed and rolled up. Time will tell if it has the desired effect of reducing livestock use in this area of Sonoran Pronghorn habitat. Getting to the work site some 9 miles from camp was another challenge or as some drivers stated, “a real Adventure.” We carpooled and caravanned in high clearance 4WD vehicles only and it took over an hour to progress the 9 miles of which 3 miles was in severe climbing and rock rolling conditions. But no flat tires oc- curred, and we finished the entire project with no injuries by 3:30. Dinners were served on Friday and Saturday nights with the sides provided by Mary and Bill Keebler andthey hosted Saturday and Sunday morning breakfasts as well. Thanks Mary and Bill! -Representing the AAF Board: Al Sue, Connie Taylor, Gary Boyer, Joe-Bill Pickrell, Ken Meadors and yours truly.